You don't have to be a mechanical genius to be an inventor. Anyone can invent - a parent wrestling with a baby sling ...a coach frustrated with slick-soled running shoes ...an office worker determined to keep the computer cords untangled. Inventing is simply finding clever solutions to everyday challenges. Author and inventor Patricia Nolan-Brown has turned common annoyances into ingenious and money-making products. 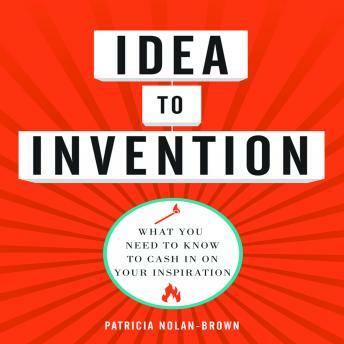 She shares the tricks of her trade in Idea to Invention, a practical guide that helps ordinary people look at their world with the eyes of an inventor. Readers will learn six simple steps to invention - and discover: how they rate on six crucial personality traits; creativity habits that spark invention; the power of tape-and-paper prototypes to refine their vision; how to navigate the ins and outs of licensing and patenting their product; the pros and cons of finding a licensed manufacturer vs. running a home-based assembly line; how to promote their invention-from perfecting the pitch and finding store buyers to trade-show shortcuts and strategies for creating buzz online; and product enhancements that add years to shelf life. From initial concept to thriving business, this handy guide simplifies the invention process and gives creative thinkers the competitive edge they need to achieve success.